As expected, linebacker Joey Porter (tricep) and running back LaRod Stephens-Howling (hamstring) are both inactive tonight with their injuries, while Derek Anderson is set to be the third quarterback. O’Brien Schofield starts in Porter’s place, and it will be interesting to see if the Cards use more 4-3 looks tonight — Gabe Watson is active while Gerald Hayes and Curtis Gatewood join Porter as inactive linebackers. Andre Roberts will return kickoffs with The Hyphen out. As a reminder, the roof is open tonight as well. In the end, it’s usually a single line of type in a newspaper, a note at the bottom of the story, a move few notice: A practice squad player getting elevated to the active roster. This time of year, it’s not uncommon although usually it makes little impact on the field. But for the player who is promoted, this is his whole world. Linebacker Curtis Gatewood got that news this week, a promotion in part because Joey Porter’s injury means the probable need for an extra ‘backer against the Cowboys. It’s not like this is brand-new for Gatewood. 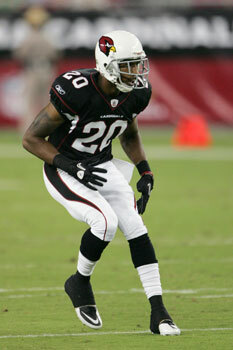 As a rookie out of Vanderbilt, he appeared in six games for Kansas City in 2008. That was after spending time with the Redskins as an undrafted free agent. Post-Chiefs, Gatewood has spent time with the Lions, Eagles, Steelers, Redskins (where he was briefly on the 53-man roster, but inactive for all three games) and then the Cardinals – twice. Sitting on the practice squad most of that time, Gatewood was anonymous, just like many practice-squad inhabitants. Some are a little more well-known, the rookies who stuck around after training camp and received some publicity. Guys like Gatewood, though, come in later and float well under the radar – both with the team and outside it. In this case, it’s Gatewood’s own Christmas miracle. A chance to play Saturday on national TV against the Cowboys, and a big bump in pay, at least for a week – his salary jumped from $5,200 a week to about $23,000. Now that his four-game suspension is over, the Cardinals have re-signed wide receiver Ed Gant to the practice squad. They had a spot when linebacker Cyril Obiozor was signed to the 53-man roster of the San Diego Chargers. 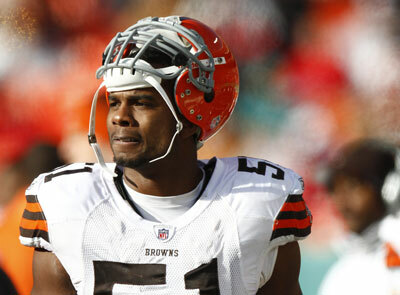 Gant served his suspension after violating the league’s policy on performance-enhancing drugs. The Cards needed to fill Obiozor’s spot at linebacker, so Curtis Gatewood was brought back to the practice squad (he was released from the practice squad a couple weeks ago), and wide receiver Tim Brown was let go. The Cardinals have made a move in search of an outside linebacker, releasing Cyril Obiozor — who had been claimed on waivers after preseason cutdowns and was active only for the Atlanta game — and signing linebacker Alex Hall. The Cardinals also released linebacker Curtis Gatewood from the practice squad. Hall, 6-foot-5 and 250 pounds, was a seventh-round pick of Cleveland in 2008 (when current Cards’ director of pro personnel T.J. McCreight was still there). A college defensive end from St. Augustine, he was part of a multi-player-and-pick trade between the Browns and Eagles. The Eagles cut him before camp, he signed with the Giants, and then was cut before the season. Veteran linebacker Clark Haggans came off the field Monday exhausted. It was pretty hot and humid, and given the dearth of linebackers — the Cards that day had just three outside ‘backers, since newcomer Cyril Obiozor had yet to arrive and practice squaders Pago Togafau and Curtis Gatewood weren’t there yet either — the 33-year-old Haggans was basically taking every rep. No one on the team is in better shape than Haggans, but he still joked that “I was looking for rookies to take my place and he’s out there next to me,” referring to Daryl Washington. By the time the team was running gassers at the end of the workout, “I was seeing heat monkeys,” Haggans said. That’ll change by Wednesday’s practice (which, because of the temperatures breaking a bit, will be back at the Cards’ Tempe facility, as will Thursday’s, instead of a planned visit to ASU’s Dickey Dome). Obiozor, Gatewood and Togafau are in place to take some snaps. Still, now that the Cards have a roster in place — at least for week one — it is an interesting breakdown. The Cards are clearly still looking to find the right combination in the secondary, which is why they have kept six cornerbacks right now. A.J. Jefferson (pictured below) has upside — I doubt he’ll be active on game days at first — and they aren’t sure yet what they have in Brandon McDonald, the newcomer from Cleveland. I am also guessing there will be a lot of nickel and dime looks, like strong safety Adrian Wilson playing in/near the box. That’s one way to not worry about needing too many linebackers. 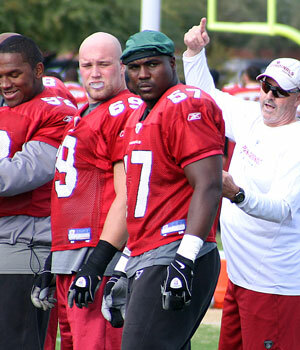 Still, the Cards only have seven LBs on the active roster and one — Obiozor — has to show he fits. — Interested to see what the Cards do with their seven defensive linemen, although since a guy like Gabe Watson actually play more special teams than most nose tackles, they may just make all seven active on game days. — WR Andre Roberts is still listed as the No. 1 punt returner, but he is going to have to show something coming back from his shoulder injury (he said Tuesday he is healed) to have that job out of the gate. Is Max Komar active in the first game? Do the Cards stick Steve Breaston back there until Roberts is ready? — I was wrong. Washington is starting by opening day. I was right. Tim Hightower is starting opening day. — I don’t know much about fullback Jerome Johnson, but they feel comfortable enough that he is the only FB on the roster. Wonder how that will work, or if the Cards use more two-tight end stuff in St. Louis. — Notice Jorrick Calvin actually made the Eagles’ roster. I don’t think he was going to make it here. Now that Marshay Green is back on the practice squad (in case you missed it, Green and Togafau rounded out the eight-man reserve group), the Cards still have the young untested group in the secondary as they search for one or two to develop. — Four undrafted guys — QB Max Hall, WR Stephen Williams, Komar and Jefferson — made the roster. Green made the practice squad. Not a bad undrafted haul, even if only a couple pan out (and it’s hard to believe Williams, at least, isn’t well on his way). The Cardinals have put together a practice squad. Three newcomers are joining G Tom Pestock, T Herman Johnson and WR Isaiah Williams. RB Ian Johnson, cut by the Vikings, is best known for being the Boise State hero in the 2007 Fiesta Bowl who ended up proposing to his now-wife at University of Phoenix Stadium after the game. The Cards are also adding WR Tim Brown — no, not that one — who was cut by the Giants (and who played for receivers coach John McNulty when both were at Rutgers) and LB Curtis Gatewood, cut by the Redskins. Gatewood has bounced around with the Lions, Chiefs, Eagles and Steelers as well as an inside ‘backer. The Cardinals still have two spots to fill, although that is expected to happen sooner rather than later. Oh, and it’s now official the Cards brought in the three waiver claim players: FB Jerome Johnson, LB Cyril Obiozor and CB Brandon McDonald.